FDA: Data provided by company "not consistent with the subsequent analysis"
(CNN) -- The Georgia company whose peanut products have been blamed for a nationwide salmonella outbreak shipped some products even though they had tested positive for the bacteria and no other tests indicated they were safe, the Food and Drug Administration said Friday. 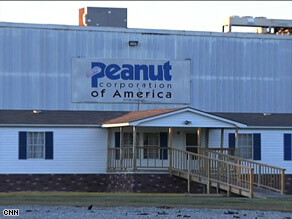 The FDA confirmed Friday the Peanut Corp.'s Blakely, Georgia, plant shipped tainted product without retesting. Previously, Peanut Corporation of America had said it shipped products only after subsequent tests on them came back negative. Items made with its peanut products have been linked to more than 500 cases of illness, including eight deaths. The agency said the company's management told FDA inspectors last month during an inspection of the plant that they shipped products that first had tested positive for salmonella, but only if they later had tested negative. But, it said, "FDA determined that certain information provided by PCA management during the inspection was not consistent with the subsequent analysis of the company's records." As a result, the agency amended its report Thursday. In some cases, it said, "no additional testing appears to have been done." No one from the company returned a call seeking comment. Federal authorities have initiated a criminal investigation into the company.